Loki is the son of giants and foster brother of Óðin. He is a trickster, a shape-changer, and the master of lies and deceit. He is the father of three monsters: the wolf Fenrir, who will swallow Óðin at Ragnarök; the monster Jörmangandr, who will drown Þór in venom at Ragnarök; and the monster Hel who presides over the hall of the dead in Niflheim, and whose hospitality includes offering visitors drinking horns full of urine. Loki plays a central role in many of the stories of the Æsir. And, he is unique among the gods in having a character which changes through the stories. At first, he was a prankster, not to be trusted, but helpful on many occasions, such as in the story of rebuilding the walls of Ásgarð. With his lies, and his habit of revealing secrets, Loki constantly stirred the gods against each other, such as in the story of Freyja's necklace. Later, he became spiteful and malevolent, such as when he cut Sif's hair. The gods' merriment over the agonies of his punishment probably turned Loki's maliciousness into a vindictive desire to destroy them. Ultimately, Loki caused the death of Baldr, wisest of the gods. As punishment, Loki now lies in a cave, bound to a rock by the entrails of his sons. A snake fastened to a stalactite above him drips venom into his face. 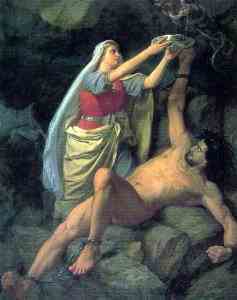 Loki's faithful wife Sigyn catches the venom in a bowl, protecting Loki from harm. When the bowl fills, she carries it away and empties it into a rock basin in the cave. During those moments, Loki is left unguarded, and the snake's venom splashes in his face. In torment, he shudders and writhes. This is the cause of earthquakes. Loki will remain bound in the cave until Ragnarök, when he will lead the monsters and the giants into battle against the gods.